Founded in 2009, EightCap is an online financial trading company based in Australia. EightCap provides immediate access to the markets and is a non-dealing desk (NDD) broker. EightCap has office locations in Asia and Europe but operates its head office at Level 11, 356 Collins Street, Melbourne, VIC, 3000 Australia. EightCap offers a wide range of trading instruments with cutting-edge technology and top-tier trading conditions. Traders are also able to access a range of accounts and flexible leverage options up to 500:1. EightCap is regulated by the Australian Securities and Investments Commission (ASIC) and holds an Australian Financial Services License #391441. ASIC is one of the most stringent financial regulatory bodies in the southern hemisphere. The regulatory body is focused on protecting the legal interests of investors that deals with the services of an Australian financial services provider. For example, ASIC requires EightCap to maintain segregated accounts for its clients’ funds at the National Australia Bank (NAB) in accordance with the Australian Client Money Rules. This means your funds at EightCap are separated from the broker’s operational funds. In terms of EightCap reliability, the broker is obligated to abide by strict regulatory requirements. In addition, EightCap also operates by the financial industry best practices and conduct regular audits to ensure that the company meets a strict compliance standard. The company’s operations are managed by a group of experienced staffs to further ensure the safety of their clients’ funds. Apart from all the above-mentioned measures, EightCap has also signed with a first-rate insurance company to provide insurance coverage for its clients’ funds. As EightCap is regulated in Australia, traders are able to take advantage of the flexible leverage options. EightCap offers traders up to 500:1 leverage on a range of trading instruments. Traders can request adjustments to their leverage via the exclusive EightCap client portal area or by getting in contact with their account manager. When it comes to trading platforms, EightCap has adopted the award-winning trading platform, the MetaTrader 4 (MT4). The MT4 platform has been widely adopted by brokers in the online trading industry and is well liked by traders from all over the world. This is because the MT4 platform comes integrated with numerous trading tools that help to enhance the trading abilities of its users. The EightCap MT4 platform comes with a complete charting package and an extended library of technical indicators which clients can overlay onto the trading charts. The MT4 also supports multiple languages and order types. The most striking feature of the EightCap MT4 platform is its ability to support automated trading through the use of expert advisors (EAs). Furthermore, with the trading servers of Eightcap located in Equinix, the world’s largest IBX data center & colocation provider, traders can be assured of lightning-fast trade execution. EightCap will be releasing exciting changes to their trading platform in coming months. Apart from trading from your desktop, EightCap has also provides a mobile-optimized version of the MT4 platform. The MT4 mobile trading app can easily be downloaded from Apple App Store or Google Play Store depending on the smartphone or mobile device operating system. The mobile trading app allows you to manage your trading account as well as make trades directly from your smartphone. In addition to its push notification feature, you can easily keep yourself updated with all the latest developments in the market. In terms of trade types and instruments, EightCap offers trading services for the spot market for several types of asset classes. These include 46 forex pairs, 12 market indices, 2 types of metal and 2 types of crude oil. These instruments can be traded in lots as small as 0.01 lot (micro lot) with leverage as high 1:500. EightCap will be adding additional products in coming months. EightCap currently offers 2 types of trading accounts, the Standard account, and the Raw account. The main differences between the 2 types of trading accounts are the spreads and the commission traders get. On the Standard account, the average spread is about 1 pip whereas the Raw account has an average spread as low as 0.0 pip. The Raw account also has a commission of $3.5/lot. Both types of accounts require a minimum deposit of $100 to open and are available in different base currencies such as AUD, EUR, GBP, NZD, SGD, USD. You are also permitted to hedge or scalp on both types of trading accounts. EightCap offers a demo version for each type of the accounts for those who want to try out the trading conditions before committing any real money. The demo environment uses the same price feeds as the live trading environment meaning that it represents an accurate scenario of what is really happening in the markets. In terms of spreads and commissions, EightCap charges a commission of $3.5 per standard lot for all trades conducted through the Raw account. As for the spreads for the Standard account, the table below shows the typical spreads which you can expect from EightCap. Withdrawal of funds can also be done through the same methods used for deposits. The typical time required for a withdrawal request is 24 hours. For international transfer of funds, a time frame of 2 to 5 business day is required. EightCap does not charge any deposit or withdrawal fees but for international wire transfer, there is a charge of approximately $20 charged by the banks which Eightcap passes on to the clients. For customer support, EightCap has provided 3 main channels for communication, by email, by telephone, and through live chat. The support service is also multilingual with the main emphasis on the English, Thai and Chinese languages. Yes, EightCap is a regulated broker under the Australian Securities Exchange Commission. EightCap is based in Melbourne, Australia. Its head office is located at Level 11, 356 Collins Street, Melbourne, VIC, 3000 Australia. How does EightCap make money? EightCap makes its money by charging its clients a commission and spread on the trades that they made on the EightCap platform. How do I deposit in EightCap account? You can fund your trading account at EightCap through bank wire transfer, credit/debit cards and a selection of online payment portals. How do I withdraw money from EightCap? Withdrawals at EightCap can be done through credit cards, bank wire transfer, and eWallets. How do I open an account with EightCap? To open an account with EightCap, you need to fill up the registration form and submit all the relevant documentation required for verification. Yes, EightCap is a reliable broker as it operates within strict regulatory requirements. Yes, EightCap uses the MetaTrader 4 trading platform. The maximum leverage offered by EightCap is 1:500. No, EightCap is not a scam. It is a legitimate broker regulated by ASIC. EigthCap is a safe broker as it operates in accordance with the industry best practices. 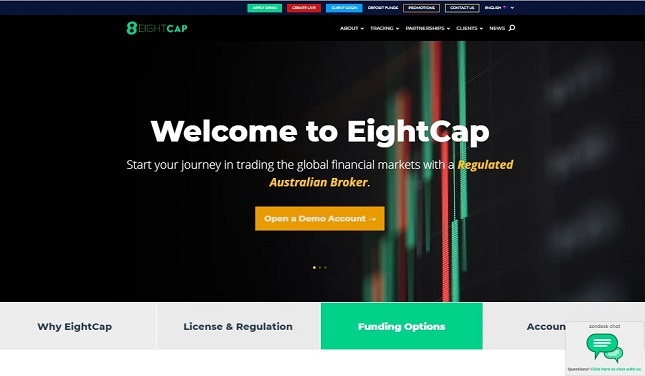 EightCap is one of the very few forex brokers that are based in Australia. The fact that it is ASIC regulated and has offices around the globe demonstrates that this broker is serious about its international outreach program. Our review shows that the broker is responsive to the needs of its clients and offer reasonably low spreads and quality customer support.